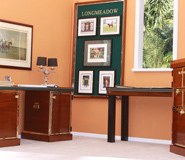 Any of our furniture pieces can be made in any color, type of wood, color of leather or Sunbrella, and any trim. 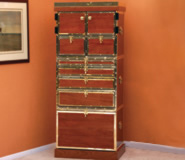 They can be edged in wood or trimmed in stainless, brass, antique brass or black metal. 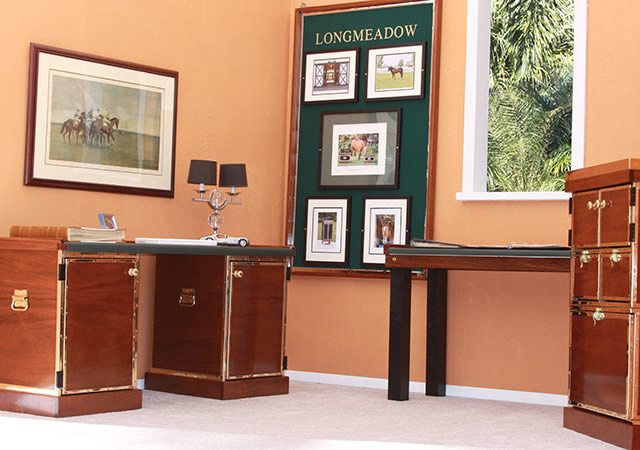 This group of furniture is made of highly figured mahogany trimmed in brass with green leather on top of the Office Desk and Office Table. The Photo Board is described in the Present section. A pretty, happy and colorful way to display your ribbons in the house or tackroom. 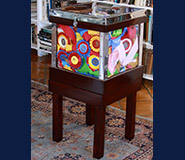 The Ribbon Box can sit on a stand as shown or on the floor or a shelf. And it can be made in a variety of woods to match your furniture. 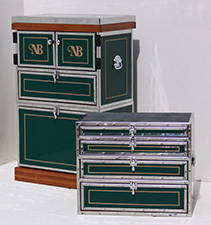 The Stacking Boxes can be made to suit what you wish to store. 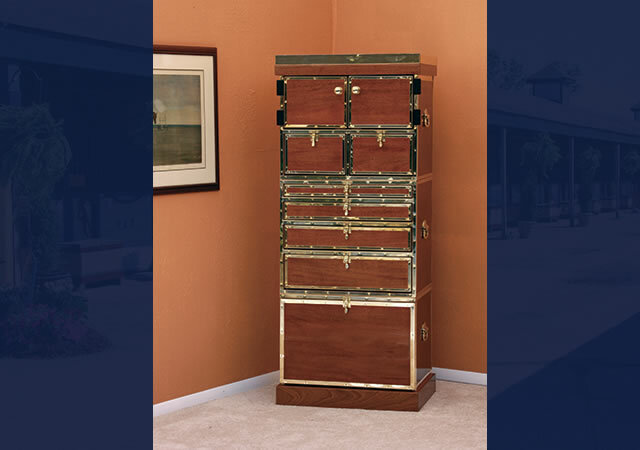 Any combination of small and big drawers, cabinets and shelves can be made. At the shows they can hold cleaning supplies, medicines, boots, bandages, vet papers, etc. And they are small enough to be easily transported. 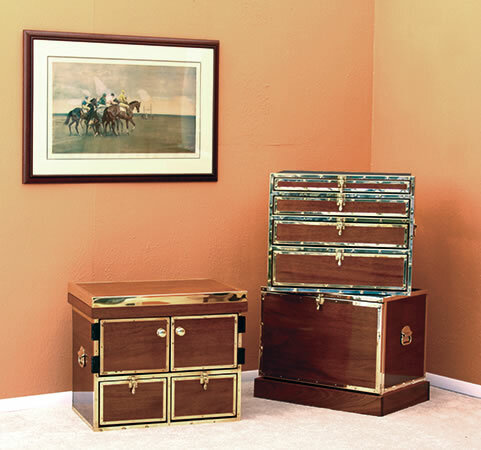 In the permanent stable tackroom, or in a home office or library the bottom drawer can be a filing cabinet. 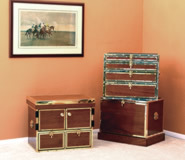 Drawers or shelves can be for catalogs, prize lists for horse shows, bookkeeping supplies, or for dvds, etc. They can be stacked two or three high, or 3 across the bottom or two on top. The Stacking Boxes are 26" across, 12" from front to back and 18" tall. Leather covered Top of Corner Desk and stacking Book cases. 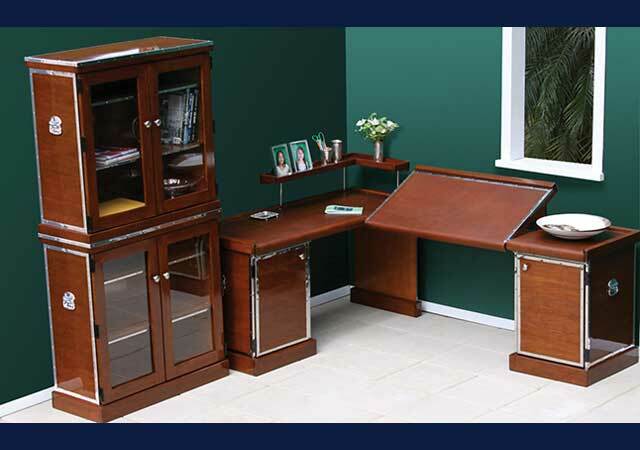 This desk comes apart in 4 sections to make moving not difficult. 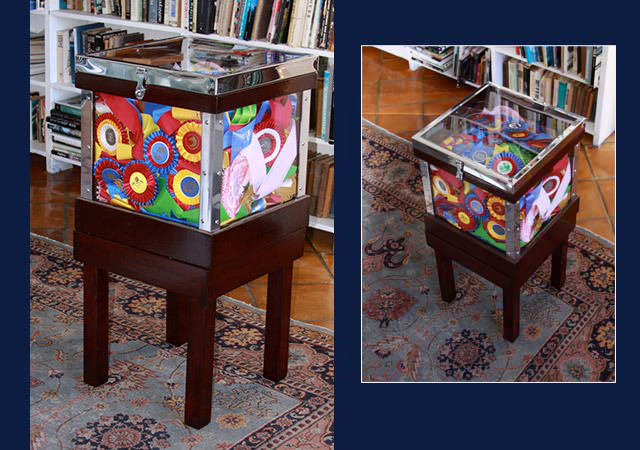 The drawing board folds down to make more surface space, and the drawers can have hanging files, etc. The Stacking Book Cases also come apart, these in 2 sections. 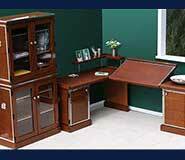 All these office pieces are Individually designed in your choice of woods, finishes, height, configuration you think would look nice in your office and make the working more pleasent.